We designed these adoption cards for folks to buy and donate to their local shelters! 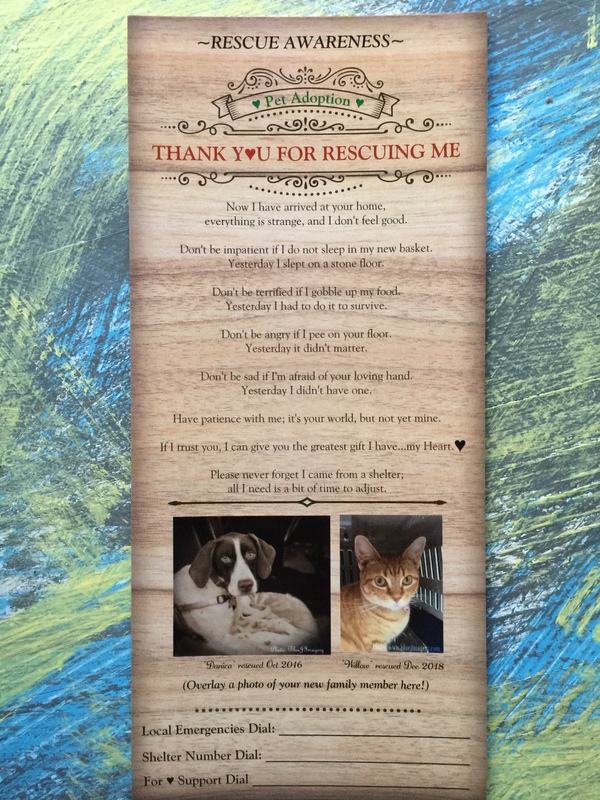 These Cards are for rescues and shelters to add to their adoption kits to help remind adopters that their new furry friends need some time to assimilate to their new environment! Let's help get the word out! Purchase in packs of 100, (or 50 pc packs) and have them drop shipped direct to an organization of your choice! These are invaluable reminders so new families don't become overwhelmed and keep expectations in line with the scary life some of these furbabies have had. Please send a request for Bulk Pricing! Now I have arrived at your home, everything is strange, and I don't feel good. Don't be impatient if I do not sleep in my new basket, yesterday I slept on a stone floor. Don't be terrified if I gobble up my food, yesterday I had to do it to survive. Don't be angry if I pee on your floor, yesterday it didnt matter. Don't be sad if I'm afraid of your loving hand, yesterday I didn't have one. Have apatience with me; it's your world but not yet mine. If I trust you, can give you the greatest gift I have... my Heart ♥. Please never forget I came from a shelter, all I need is a bit of time to adjust.